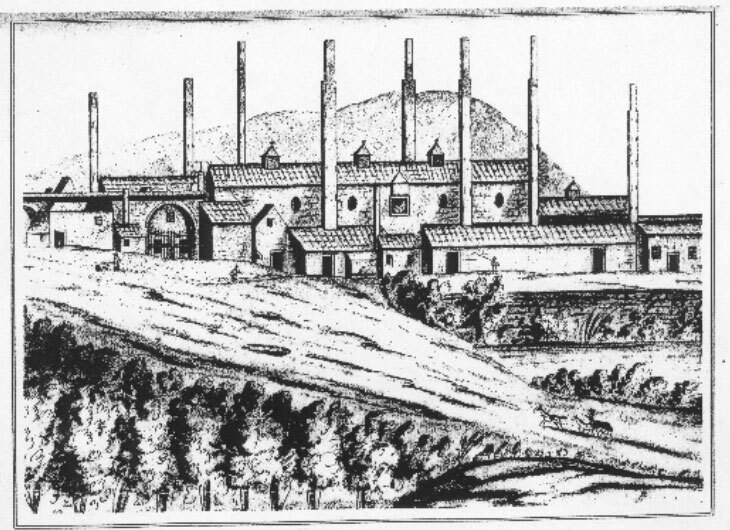 The Llangavelach Copper Works, near Swansea, 1745 (George Grant-Francis. On the Smelting of Copper in South Wales. Pritchett & Taylor, Printers, London. 1881: 106). With the removal of monopoly, the copper smelting industry was able to develop in the 1680s, predominantly in South Wales, but also in Bristol. Major figures like John Coster, who has rightly been called the “father of Cornish copper mining”, leased copper mines in Cornwall to ensure supply of copper ores. The demand for copper ores now stimulated the opening up and development of the incredibly rich copper resources around Camborne and Redruth in Cornwall. By 1717 the first smelting works were constructed at Swansea, South Wales. They were within easy reach of the South Wales coalfields and a day’s sailing closer to Cornwall than Bristol or Neath. These advantages soon made Swansea the world’s centre of copper smelting for nearly 150 years. By 1800 the banks of the River Tawe at Swansea were heavily developed by various smelting works.